We are a small company with a large heart. Started in the year 2011, we are makers of flame re-tardant apparel, industrial workwear, & bespoke safety..
Our values determine how we treat our people, clients, and partners. They define who we are and how we do our jobs. They also help us to work together in the most effective way. 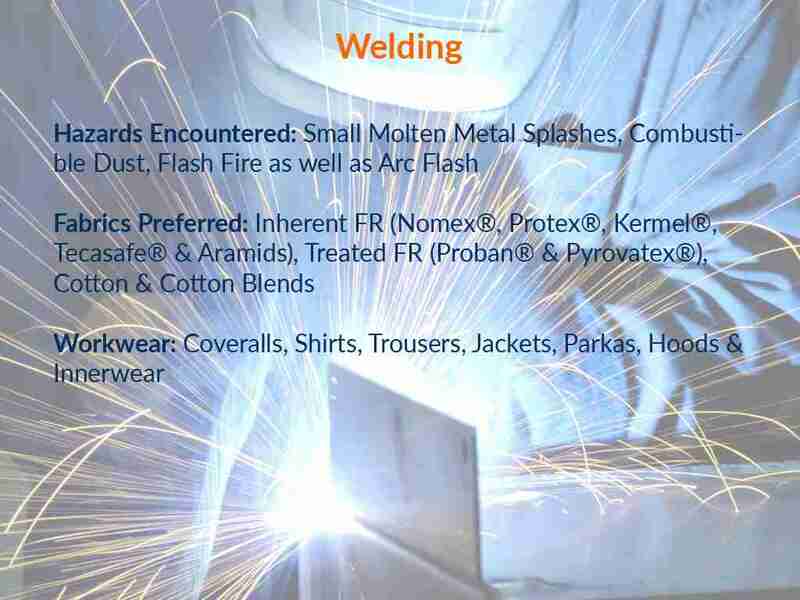 Protective clothing — Protection against Heat & flame - Limited flame spread materials, material assemblies. 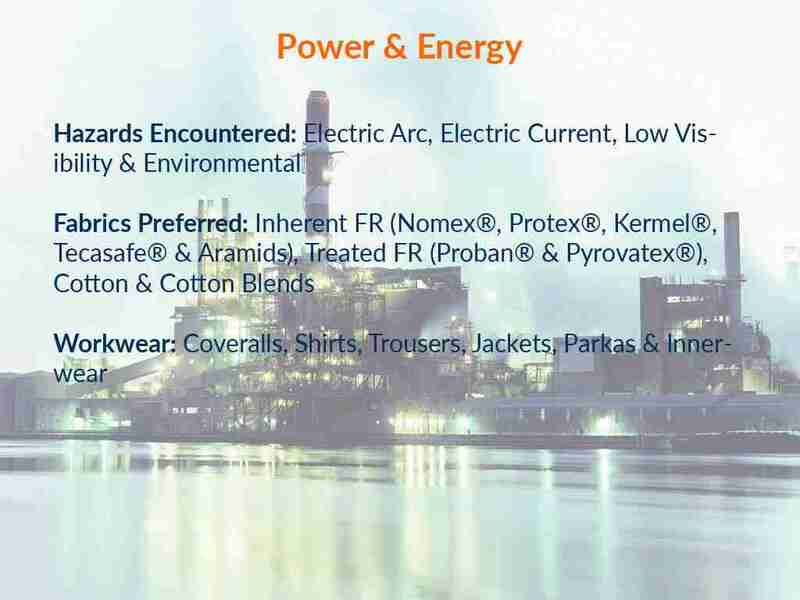 Standard performance specification for flame resistant & arc rated textile materials. 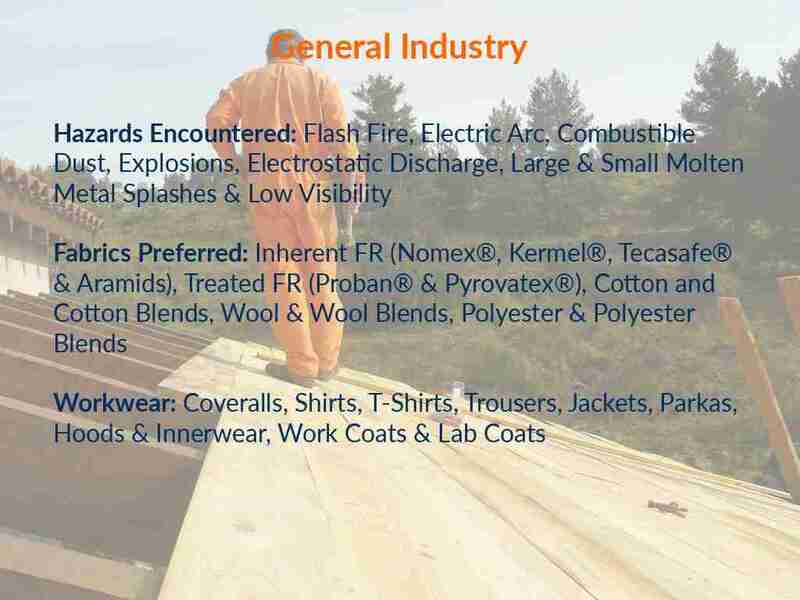 Standard on Flame Resistant Garments for the protection of Industrial Personnel Against Flash Fire. 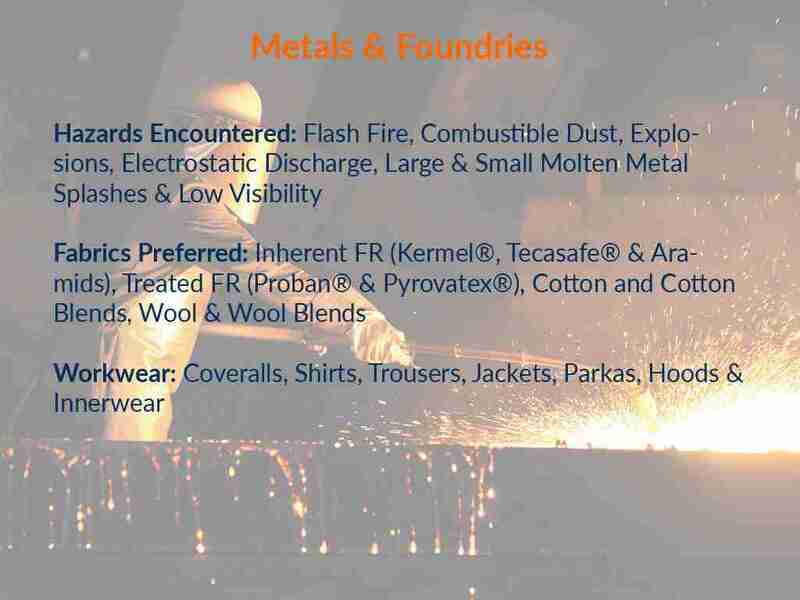 Standard on Selection, Care, Use and Maintenance of Flame Resistant Garments for Protection. Standard for the Flammability of Clothing Textiles (not related to Flame resistant clothing textiles). OSHA Regulation / US general requirement for employers to assess hazards in the workplace. Location - we are located in a place where any fabric is available, meaning sourcing anything is not a problem, but a boon. AFA (Ask for Anything) related to fabrics of course, we will get it. Versatility - we make any design in work wear specially coveralls, you design it, we make it, we design it & we make it. You portray it & we make it. Takes time of course, but we do it. Quality - No compromises, no cutting corners, we just don’t do it. Giving the best is what we do and like to do. Genuineness - Giving what we say we are giving. Competitive – Best prices for the Quality we give. Guarantee – No Questions asked return policy. If at all the product does not meet your high standards, we will be happy to replace it. © 2016-17, blueprogear.com. All Rights Reserved. Protective clothing according to EN ISO 14116 may consist of severalseparate garments, or a single garment with one or more layers. All assemblies claiming compliance with this standard shall achieve a limited flame spread index of 1, 2 or 3 when tested in accordance with ISO 15025. The selection and use of high-visibility clothing should be based on a risk assessment of the conditions in which the wearer of the high-visibility clothing will be working. EN 14360:2004 creates a basis on which the waterproofness of rain-protective clothing can be tested throughout the EU under appropriate practical conditions. 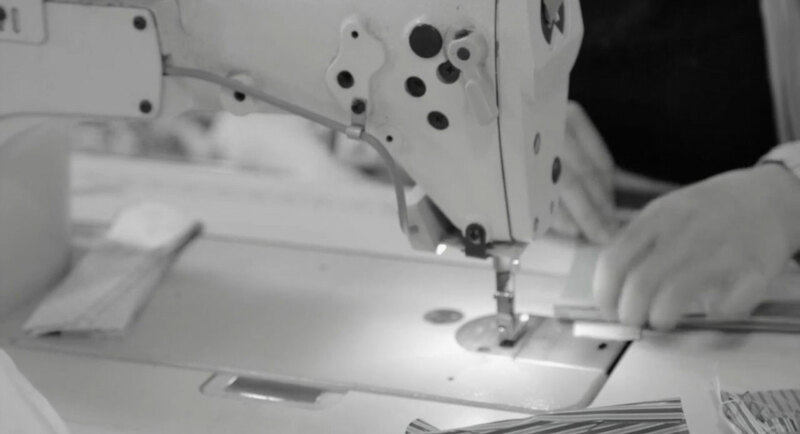 Impermeability to rain is an important characteristic that is tested on the complete garment in order to test, in particular, its constructional design characteristics. To do so, a stationary test mannequin is exposed to artificial rain. EN 14360 applies to the testing of jackets, trousers, coats and one or two piece suits. 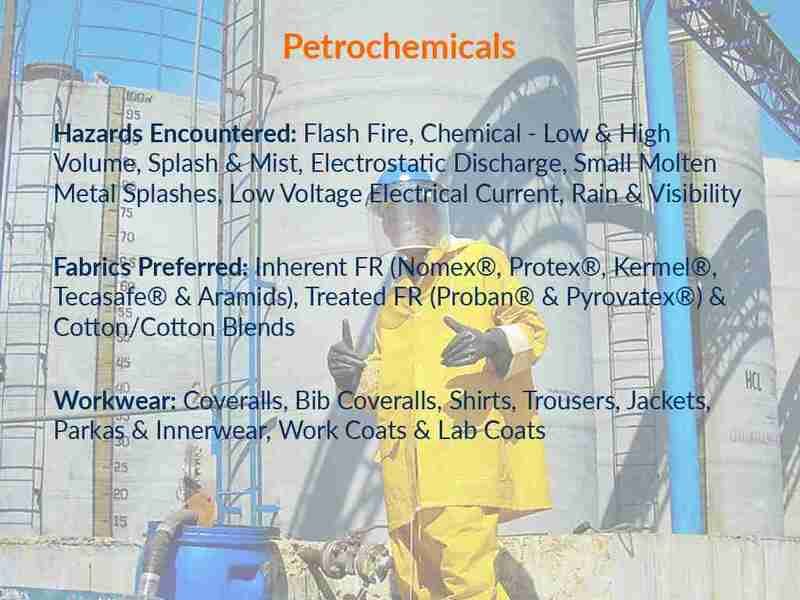 This standard specifies the minimum requirements for limited use and re-useable limited performance chemical protective clothing. 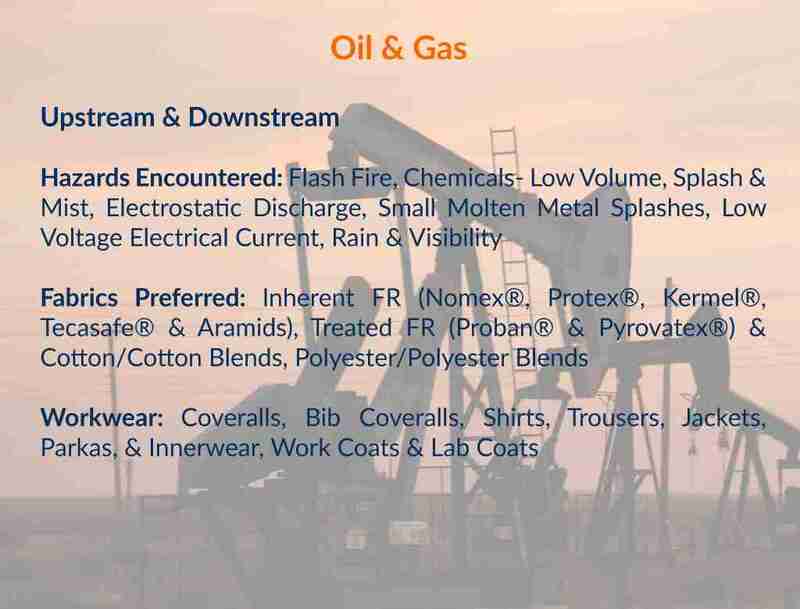 Limited performance chemical protective clothing is intended for use in cases of a potential exposure to a light spray, liquid aerosols or low pressure, low volume splashes, against which a complete liquid permeation barrier (at the molecular level) is not required. This standard addresses electrical safety related work practices for employee workplaces & includes guidance for selecting the appropriate Arc Flash PPE (Personal Protective Equipment) for the employees. One of the following methods shall be used for the selection of PPE. Incident Energy Analysis - Determine the potential incident energy exposure of the worker in cal/cm². Based on this analysis, the worker must wear PPE with an Arc Thermal Performance Value (ATPV - measured in cal/cm²), or EBT greater than the potential exposure level. 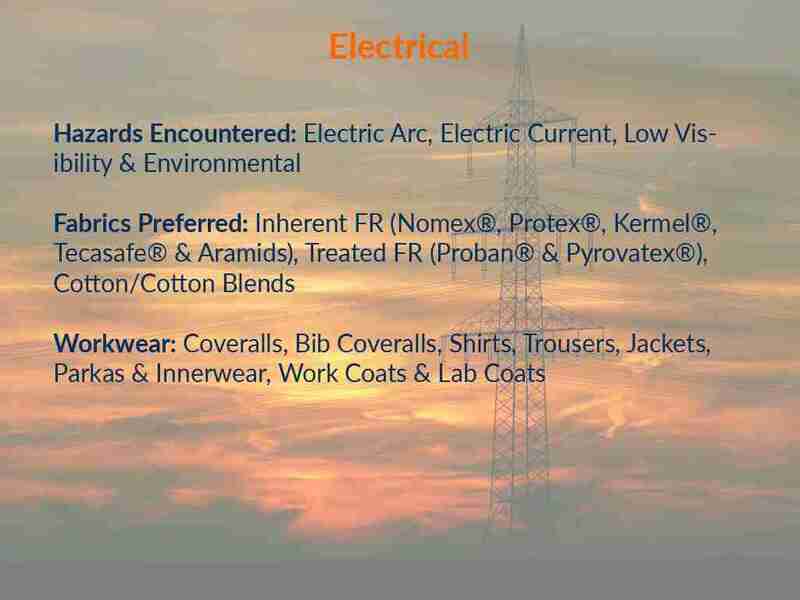 Standard performance specification for flame resistant & arc rated textile materials for wearing apparel for use by electrical workers exposed to momentary electric arc and related thermal hazards. The fabric must not melt, drip, or have more than 2.0 seconds after flame or 6.0 inches char Length when tested as received and after 25 launderings or dry cleanings. Testing for flame resistance is in accordance with ASTM Test Method D6413. The fabric may not have more than 5.0 seconds After flame time when tested as received in accordance with ASTM Test Method F1959. The arc rating is reported as either: arc rating ATPV or arc rating EBT (if the ATPV cannot be calculated because of fabric break open). The arc rating is reported as guidance on the performance of the fabric in arc exposure testing. There is no minimum required value for arc rating. The standard provides a minimum performance specification & certifications that Fabric & garments must achieve in order to be considered flame resistant. In order for these standards to be met, a comprehensive battery of thermal tests must be passed. Must be by a third party to the manufacturer or vendor without a monetary interest in the product’s profitability. ASTM D6413 – Vertical Flammability test: Fabric must not have more than a maximum of two seconds after flame and a 4-inch char length. Thermal Stability test: Fabric must not melt or drip, separate or ignite after five minutes in an oven at 260° C (500 degrees Fahrenheit). Thermal Shrinkage test: Fabric must not shrink more than 10 percent after five minutes in an oven at 260° C (500 degrees Fahrenheit). 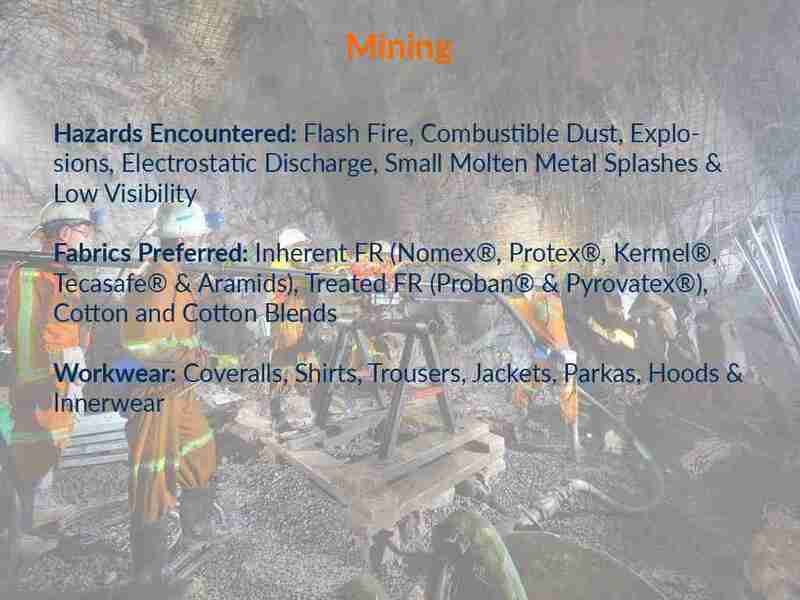 Standard on Selection, Care, Use and Maintenance of Flame Resistant Garments for Protection of Industrial Personnel Against Flash Fire. Requires that a hazard analysis be performed for the industrial work place. Establishes three classes of flammability. The classes are based on measurement of burn time, along with visual observations of flame intensity. Note: Only Class 1 & 2 rated fabrics are used for all wearing apparel in the US. The employer shall ensure that each employee who is exposed to the hazards of flames or electric arcs does not wear clothing that, when exposed to flames or electric arcs, could increase the extent of injury that would be sustained by the employee. NOTE: Clothing made from the following types of fabrics, either alone or in blends, is prohibited by this paragraph, unless the employer can demonstrate that the fabric has been treated to withstand the conditions that may be encountered or that the clothing is worn in such a manner as to eliminate the hazard involved: acetate, nylon, polyester, rayon. by reason of hazards of processes or environment, chemical hazards, radiological hazards, or mechanical irritants encountered in a manner capable of causing injury or impairment in the function of any part of the body through absorption, inhalation or physical contact.